Make your homemade graham crackers in advance or simply purchase graham crackers from the store. In a mixing bowl, beat the cream cheese until fluffy. Slowly add the icing sugar to taste. Add in a couple scraped vanilla beans and maple extract or a teaspoon of fresh lemon juice if you prefer. Store in fridge. You can also make this in advance! Hull a pint of strawberries and dice. 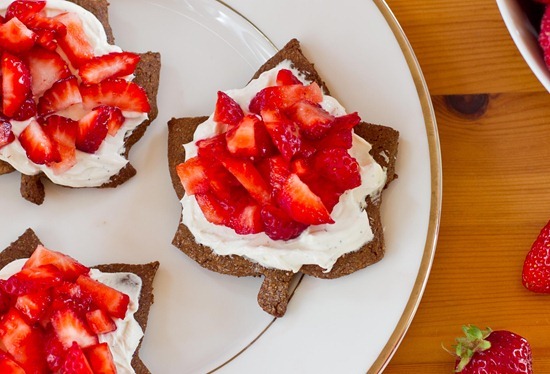 Lay your graham crackers onto a large serving plate and spread with cream cheese frosting. Sprinkle on diced strawberries and sugar. Inspired by Hungry Foodies Pharmacy.